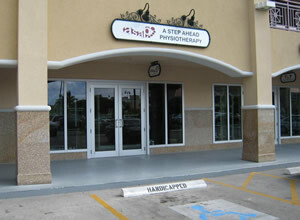 A Step Ahead Physiotherapy, Cayman accepts most private insurance plans. Our office staff will be happy to contact your insurance company and obtain your current physical therapy benefits and explain them to you. Our billing department will bill your insurance company directly; however, patients are responsible for their co-payment at each visit. We accept cash, check, and debits cards. Any billing questions can be directed to our billing department by phone or email. If your deductible has been met, most insurance plans cover 80% of each treatment session. However, some plans have a per treatment maximum and can vary on which services are reimbursable. Our billing department will make every attempt to determine your insurance benefits to ensure maximum coverage; however, it is ultimately the patient’s responsibility to be informed of their individual plan and its coverage. ASAP does not require a medical referral for treatment; however, many insurance companies require them for reimbursement purposes. Running shoes if you are coming in for a foot/running issue. The initial appointment will last about an hour. Subsequent appointment times will vary depending on what treatments need to be performed. They can range from 30 minutes to 1 hour. At the first appointment you will fill out a patient questionnaire to assist the therapist in collecting information pertaining to your current condition. Please arrive 15 minutes prior to your scheduled appointment time to ensure adequate time to fill out the necessary paperwork. The more detailed and accurate your information is, the better your treatment. Your initial evaluation will consist of a patient history taken by the therapist. This is a verbal account of your current condition and what has brought you to ASAP. This will be followed by a series of functional tests to determine the current status of your sensory, motor and coordination skills. After collecting the necessary data, the therapist will determine the best method of treating your condition to reduce symptoms and correct any biomechanical issues which may be contributing to the problem. Keep in mind that often, the driving force behind an injury may not be at the location of symptoms. It may be necessary to treat a foot problem to eliminate knee pain. The main goal of the initial evaluation is to determine the driving force of the symptoms. Depending on how involved the initial assessment is will determine the amount of time remaining to begin treatment. The therapist will determine a plan of care and will explain this to you. This will consist of and explanation of your current condition, the best treatment options to correct the problem, and how frequent treatment sessions should be for optimal recovery. Whenever possible the therapist will give you an estimated time for full recovery. Please keep in mind that all bodies heal at different rates and this is just an estimate. The therapist reserves the right to amend this once treatment is underway. At the first appointment, you may or may not receive some exercises to perform at home. This will be left to the therpist’s discretion. Most patients will receive a home exercise program at some point during their physio treatment. If you're a new patient with ASAP, welcome! To save you time and effort, please take a moment to print and fill out the following quick forms. This will ensure your time with us will be relaxing and focused on your treatment. If you have any questions about the contents of these forms, call us at 345. 745. ASAP (2727).Please bring your completed forms with you to your first appointment. Thank you for your assistance, and again, welcome to A Step Ahead Physiotherapy.